For the tribe in Washington state, see Sauk-Suiattle Indian Tribe of Washington. "Sacs" redirects here. For other uses, see SACS (disambiguation). 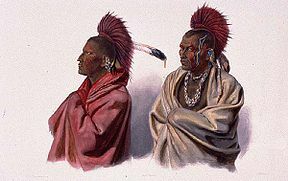 Massika, a Sauk Indian, left, and Wakusasse, right, of the Meskwaki. By Karl Bodmer, aquatint made at St. Louis, Missouri in March or April 1833 when Massika pleaded for the release of war chief, Blackhawk, following the Black Hawk War. 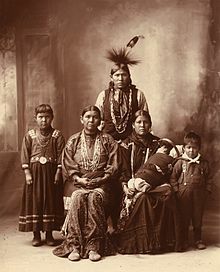 The Sac or Sauk are a group of Native Americans of the Eastern Woodlands culture group, who lived primarily in the region of what is now Green Bay, Wisconsin, when first encountered by the French in 1667. Their autonym is oθaakiiwaki, and their exonym is Ozaagii(-wag) in Ojibwe. The latter name was transliterated into French and English by colonists of those cultures. Today they have three federally recognized tribes, together with the Meskwaki (Fox), located in Iowa, Oklahoma and Kansas. The Sauk, an Algonquian languages people, are believed to have developed as a people along the St. Lawrence River. They were driven by pressure from other tribes, especially the powerful Iroquois League or Haudenosaunee. It is believed by some historians that they then migrated to what is now eastern Michigan, where they settled around Saginaw Bay. This leads to the theory that, due to the yellow-clay soils found around Saginaw Bay, they called themselves the autonym of Oθaakiiwaki (often interpreted to mean "yellow-earth".) Some native Ojibwe oral histories also place the Sauk in the Saginaw Valley some time before the arrival of Europeans. The neighboring Anishanabeg Ojibwe and Ottawa peoples referred to them by the exonym Ozaagii, meaning "those at the outlet". French colonists transliterated that as Sac and the English as "Sauk". Anishinaabe expansion and the Huron attempt to gain regional stability drove the Sac out of their territory. The Huron were armed with guns supplied by their French trading partners. The Sac moved south to territory in parts of what are now northern Illinois and Wisconsin. A closely allied tribe, the Meskwaki (Fox), were noted for resisting French encroachment, having fought two wars against them in the early 18th century. After a devastating battle of September 9, 1730, in Illinois, in which hundreds of warriors were killed and many women and children taken captive by French allies, Fox refugees took shelter with the Sac, making them subject to French attack. The Sac continued moving west to Iowa and Kansas. Two important leaders arose among the Sac: Keokuk and Black Hawk. At first Keokuk accepted the loss of land as inevitable in the face of the vast numbers of white soldiers and settlers coming west. He tried to preserve tribal land and his people, and to keep the peace. Having failed to receive expected supplies from the Americans on credit, Black Hawk wanted to fight, saying his people were "forced into war by being deceived". Led by Black Hawk in 1832, the mainly Sac band resisted the continued loss of lands (in western Illinois, this time.) Their warfare with United States forces resulted in defeat at the hands of General Edmund P. Gaines in the Black Hawk War. About this time, one group of Sac moved into Missouri, and later to Kansas and Nebraska. In 1869 the larger group of Sac moved into reservations in Oklahoma, where they merged with the Meskwaki as the federally recognized Sac and Fox Nation. (The United States had been making treaties with them together since their residency in the Midwest.) A smaller number returned to the Midwest from Oklahoma (or resisted leaving.) They joined the Mesquakie at the Mesqwaki Settlement, Iowa. Originally, the Sauk had a patrilineal clan system, in which descent and inheritance was traced through the father. Clans which continue are: Fish, Ocean/Sea, Thunder, Bear, Fox, Potato, Deer, Beaver, Snow, and Wolf. The tribe was governed by a council of sacred clan chiefs, a war chief, the head of families, and the warriors. Chiefs were recognized in three categories: civil, war, and ceremonial. Only the civil chiefs were hereditary. The other two chiefs were recognized by bands after they demonstrated their ability or spiritual power. This traditional manner of selecting historic clan chiefs and governance was replaced in the 19th century by the United States appointing leaders through their agents at the Sac and Fox Agency, or reservation in Indian Territory (now Oklahoma). In the 20th century, the tribe adopted a constitutional government patterned after the United States form. They elect their chiefs. Sac and Fox Nation of Missouri in Kansas and Nebraska, headquartered in Reserve, Kansas. Sauk is one of the many Algonquian languages. It is very closely related to the varieties spoken by the Meskwaki and the Kickapoo tribes; linguists often describe these three as dialects of the same language. Each of the dialects contains archaisms and innovations that distinguish them from each other. Sauk and Meskwaki appear to be the most closely related of the three, reflecting the peoples' long relationship. Sauk is considered to be mutually intelligible, to a point, with Fox. In their own language, the Sauk at one time called themselves asakiwaki [a-‘sak-i-wa-ki], "people of the outlet". The Sauk people have a syllabic orthography for their language. They published a Primer Book in 1975, based on a "traditional" syllabary that existed in 1906. It is intended to help modern-day Sauk to learn to write and speak their ancestral tongue. A newer orthography was proposed around 1994 to aid in language revival. The former syllabary was aimed at remaining native speakers of Sauk; the more recent orthography was developed for native English speakers, as many Sauk grow up with English as their first language (Müller 1994). Sauk has so few speakers that it is considered an endangered language, as are numerous others native to North America. In 2005, A Concise Dictionary of the Sauk Language was published using the Algonquianist Standard Roman Orthography. In 2012, Shawnee High School in Shawnee, Oklahoma, began to offer a Sauk language course. Sauk does not have many phonemes in comparison to many other languages: four vowels, two semivowels, and nine consonants. The representation of /h/ was omitted in the 1977 syllabary. It was added back in later editions because it is an important distinctive sound in the Sauk language[page needed]. Müller (1994) symbolizes /j/ as /y/, following Americanist practice. Ho! Ne nu ta ma! "Two turtles were sunning on a bank when a thunderstorm approached. When it began to rain, one turtle said to the other, 'I don’t want to get wet,' and jumped into the lake." Lake Osakis in west-central Minnesota, the Sauk River, which flows from Lake Osakis, and the towns of Osakis, Sauk Centre, and Sauk Rapids all were named for association historically with a small party of Sac who made camp on the shores of Lake Osakis. They had been banished from their tribe for murder. According to Anishinaabe oral tradition, these five Sac were killed by local Dakota in the late 18th century. Iowa: Sac City, Sac County, and Sac Township. Illinois: Sauk Village; Sauk Valley: the cities of Dixon, Sterling, Rock Falls and the surrounding area; Sauk Trail, a winding road south of Chicago, said to follow an old Indian trail; Johnson-Sauk Trail State Recreation Area; and Black Hawk College [Moline and Kewanee, IL]. Michigan: The name of Saginaw is believed to mean "where the Sauk were" in Ojibwe; and the Saginaw Trail is said to follow an ancient Native American trail. US Route 12 in Michigan is said to follow the Sauk Native American trail. Minnesota: City of Sauk Centre, Le Sauk and Little Sauk townships, Lake Osakis, Sauk River, Sauk Rapids. Wikimedia Commons has media related to Sac. ^ "Government - Sac & Fox Nation". Sac & Fox Nation. 2009. Retrieved 17 June 2018. ^ "Tribal Governments by Tribe: S". Archived 12 April 2010 at the Wayback Machine National Congress of the American Indian. Retrieved 11 April 2010. ^ Bonvillain, Nancy (1995). The Sac and Fox. Chelsea House Publishers. pp. 13, 17. ^ Whittaker, Gordon (2005). A Concise Dictionary of the Sauk Language (PDF). Stroud, Oklahoma: The Sac & Fox National Public Library. ^ Carmen Bourlon (11 August 2012). "Shawnee High School to offer new course on endangered Sauk language". The Shawnee News-Star. Shawnee, OK. Archived from the original on 29 January 2013. Retrieved 21 August 2012. ^ "I love Sauk Language | Cultural Survival". www.culturalsurvival.org. Retrieved 16 March 2017. ^ "Mesquakie-Sauk Pronunciation Guide, Alphabet and Phonology (Sac and Fox)". www.native-languages.org. Retrieved 16 March 2017. ^ Müller, Reinschmidt, Kerstin (1 January 1995). "Language Preservation With The Help Of Written Language: The Sauk Language Of The Sac And Fox Of Oklahoma". ISSN 0831-5671. ^ Upham, Warren (2001). Minnesota Place Names, A Geographical Encyclopedia, 3rd Edition. Saint Paul, Minnesota: Minnesota Historical Society. p. 53. ISBN 0-87351-396-7. ^ Pielack, Leslie (2018). The Saginaw Trail From Native American Path to Woodward Avenue. Chicago: Arcadia Publishing Inc. p. 10. ISBN 9781439664865. OCLC 1044964376. ^ Morrison, Roger L. (Autumn 1937). "The History and Development of Michigan Highways". Michigan Alumnus Quarterly Review. Ann Arbor, MI: University of Michigan Bureau of Alumni Relations. 39 (54): 59–73. OCLC 698029175. "I love Sauk Language". Cultural Survival. Retrieved 9 August 2012.